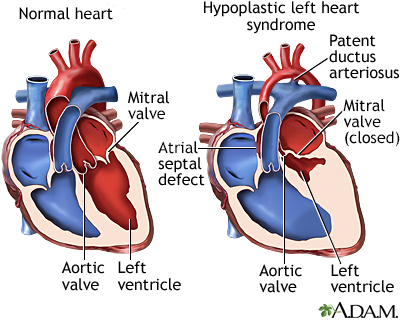 Hypoplastic left heart syndrome occurs when parts of the left side of the heart (mitral valve, left ventricle, aortic valve, and aorta) do not develop completely. The condition is present at birth (congenital). As with most congenital heart defects, there is no known cause. About 10% of babies with hypoplastic left heart syndrome also have other birth defects. It is also associated with some genetic diseases such as Turner syndrome, Jacobsen sydrome, trisomy 13 and 18. This causes the left ventricle and aorta to be poorly developed, or hypoplastic. 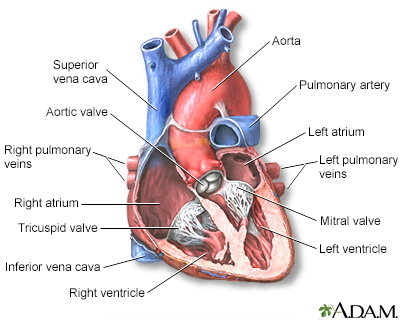 In most cases, the left ventricle and aorta are much smaller than normal. In babies with this condition, the left side of the heart is unable to send enough blood to the body. 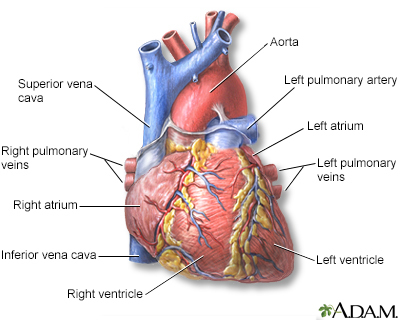 As a result, the right side of the heart must maintain the circulation for both the lungs and the body. The right ventricle can support the circulation to both the lungs and the body for a while, but this extra workload eventually causes the right side of the heart to fail. In babies with hypoplastic left heart syndrome, blood leaving the right side of the heart through the pulmonary artery travels through the ductus arteriosus to the aorta. This is the only way for blood to get to the body. If the ductus arteriosus is allowed to close in a baby with hypoplastic left heart syndrome, the baby may quickly die because no blood will be pumped to the body. Babies with known hypoplastic left heart syndrome are usually started on a medicine to keep the ductus arteriosus open. Because there is little or no flow out of the left heart, blood returning to the heart from the lungs needs to pass through the foramen ovale or an atrial septal defect (a hole connecting the collecting chambers on the left and right sides of the heart) back to the right side of the heart. If there is no foramen ovale, or if it is too small, the baby could die. Babies with this problem have the hole between their atria opened, either with surgery or using a thin, flexible tube (heart catheterization). A bluish color in the chest or abdomen, lips, and tongue is abnormal (called central cyanosis). It is a sign that there is not enough oxygen in the blood. Central cyanosis often increases with crying. Also, the pulse at various locations (wrist, groin, and others) may be very weak. There are often (but not always) abnormal heart sounds when listening to the chest. A variation of the Norwood procedure, called the Sano procedure, may be used. This procedure creates a right ventricle to pulmonary artery connection. Afterward, the baby goes home in most cases. The child will need to take daily medicines and be closely followed by a pediatric cardiologist, who will determine when the second stage of surgery should be done. Stage II of the operation is called the Glenn shunt or hemi-Fontan procedure. It is also referred to as a cavopulmonary shunt. This procedure connects the major vein carrying blue blood from the top half of the body (the superior vena cava) directly to blood vessels to the lungs (pulmonary arteries) to get oxygen. The surgery is most often done when the child is 4 to 6 months of age. Stage III, the final step, is called the Fontan procedure. The rest of the veins that carry blue blood from the body (the inferior vena cava) are connected directly to the blood vessels to the lungs. The right ventricle now serves only as the pumping chamber for the body (no longer the lungs and the body). This surgery is usually performed when the baby is 18 months to 4 years old. After this final step, the child is no longer cyanotic and has a normal oxygen level in the blood. Some people may need more surgeries in their 20s or 30s if they develop hard to control arrhythmias or other complications of the Fontan procedure. Some doctors consider heart transplantation an alternative to the 3 step surgery. But there are few donated hearts available for small infants. If left untreated, hypoplastic left heart syndrome is fatal. Survival rates for the staged repair continue to rise as surgery techniques and care after surgery improve. Survival after the first stage is more than 75%. Children who survive their first year have a very good chance for long-term survival. The child's outcome after surgery depends on the size and function of the right ventricle. There is no known prevention for hypoplastic left heart syndrome. As with many congenital diseases, the causes of hypoplastic left heart syndrome are uncertain and have not been linked to a mother's disease or behavior.